Tag Archive | "Shanghai Masters"
After being disappointed at the U.S. Open, Roger Federer and Andy Murray are hoping to finish the season on a positive note. Therefore, reaching the final of the Shanghai Rolex Masters is undoubtedly a good start. However, only one player could walk away triumphant. 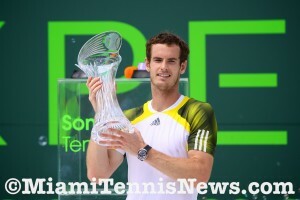 Murray schooled Federer 6-3,6-2 to win his second title of the year and his sixth masters’ shield. Essentially, the initial game orchestrated the course of the match. Following Federer’s forehand error on game point, Murray connected on a forehand crosscourt pass for a winner. When Federer sent another forehand crosscourt wide, Murray pocketed the break. Once Murray easily consolidated, on a backhand crosscourt miscue by Federer, he again had break point. However, Federer came up with the shots to erase the deficit and eventually guard serve. Serving at 2-1, Murray dumped a forehand into the net giving Federer his first break point. But, Federer squandered that opportunity with an ill advised dropshot. As Murray cruised on serve, Federer struggled to keep the arrears to just one break. Down 3-5, Federer opened serve with a double fault. Later, by sticking a forehand up the line pass, Murray fabricated double set point. With another sublime forehand crosscourt pass, Murray closed out the set. The key to Federer’s success is his ability to alter strategy once cornered. When a backhand volley winner and forced miscues from Murray gave Federer double break point, the impression was that a comeback was eminent. Yet, Federer could not capitalize as his backhand crosscourt found the net and his forehand sailed long. After holding serve for 1 all, Federer again manufactured double break point. Still, with Murray’s backhand down the line winner, Federer was at deuce and zero for six on break points. Ultimately, Murray wrapped up the game with an ace for 2-1. The next game, by pushing a forehand long, Federer gifted Murray a break point. On the subsequent point, influenced by Murray, the line judge signaled a close shot long. Federer challenged and the ball was shown to skid off the line. The point was replayed in lieu of Federer being awarded the point, this proved costly. 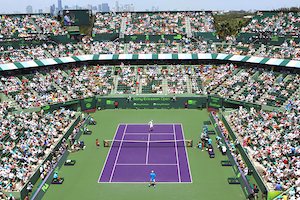 As Federer’s forehand landed wide, Murray took a 3-1 lead, then consolidated with a love game. Untroubled on his serve, Murray extended his advantage to 5-2. 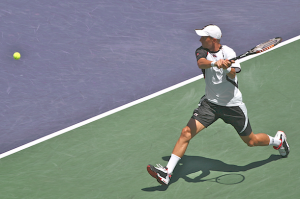 Serving to prolong the match, Federer dumped a backhand volley into the net off a low stroke by Murray handing the latter championship point. Federer managed to wipe out it and later obtained game point with an ace. However, with his twenty-ninth unforced error, Federer stared at deuce. Shortly thereafter, Federer buried a forehand up the line into the net, his eighteenth on that stroke, to donate to Murray his second championship point. When Federer flubbed the backhand volley, Murray collected the title.